Begin lying on your stomach, bending your elbows so that they make a “W” position. Pinch your shoulder blades together, and then lift your arms. Keep your palms pointed down. Repeat for 2×10. Begin lying on your stomach, bringing your arms up to the side so that they make a “T” position. Pinch your shoulder blades together, and then lift your arms. Keep your palms pointed down. Repeat for 2×10. 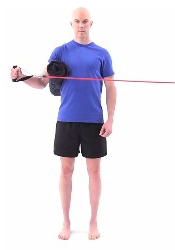 Standing with a small towel rolled up between our elbow and your side, pull out against a resistance band. Keep your elbow at a 90⁰ angle and your wrist straight. Repeat for 3×15. Holding one band in each arm, keep your palms forward and your elbows straight. Pull the bands back so they are even with your sides, then control it back to the resting position. Repeat for 3×15. 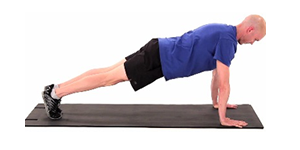 Starting in a plank position, push your shoulders up. Hold this position and tap one hand on the other 10x each. Repeat for 2 sets. Begin lying on your stomach, bringing your arms up to the side so that they make a “Y” position. Pinch your shoulder blades together, and then lift your arms. Keep your palms pointed down. Repeat for 2×10. 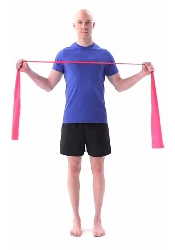 Begin standing, holding a band in both hands (you can use two bands attached to the wall instead of a single band). Pull the band apart so that both arms make a “W” shape. Repeat for 3×15. You can attach your resistance band or sport cord to the fence for the band exercises.